It's been awhile since I've done any KidPages posts. I've been having a hard time just keeping up with my regular book reviews, which is why I've been slacking. I do share our favorites on Instagram though, so if you've been looking for more picture book recommendations, you can follow me there. The parent/child bedtime struggle . . . we've all been there. The later it gets, the more quick-witted the kids seem to be (and, by default, the slower, tireder, and, in my case, crankier the parents are). Kids can think of a million reasons to stay up for just a few more minutes. And Little Dragon is no different. (For the sake of this review, we will call him Cedric. There's nothing that explicitly says that's his name, but if you read the book, you'll see why it's a good choice.) The bedtime ritual starts out peacefully enough: he plays, eats some cookies and milk, brushes his teeth, takes a bath (this all occurs on the endpapers), and finally, settles down with his favorite book. His mother cheerfully reads it, and at the end of it, Cedric asks for it again. A child asking to hear a favorite story again? It's a difficult thing to refuse. (I know. My kids tempt me every single night). Cedric's mom gives in. She reads it again. But you see where this book is going. And each repetition gets shorter and less comprehensive as fatigue and exhaustion set in. As often happens, the story is putting Cedric's mom to sleep, but not Cedric himself, who gets more and more animated (and obnoxious) the longer he's up. Finally, Cedric's mom cannot resist sleep any longer (I plead guilty of falling asleep while reading to my kids, too). But Cedric won't give up. He jumps up and down on her chest screaming, "Again! Again! Again!" In an irrational moment, he blows a fiery hole through the very thing he wanted so much. It's abrupt, but if your kids have reached the point of psychotic and irrational behavior, then bedtime often is. We parents can only be patient so long. Eventually, a line is crossed, and then it's over. Just like that. Parents will like the abrupt ending because it's so true to life. And kids will like it because it's unexpected and funny. And that's the way the whole book is: a little bit for the adults, a little bit for the kids. The balance is just about perfect. Also, the text is pretty genius. It's a combination of the words in Cedric's bedtime story and the ever-insistent (and more and more obnoxious) "Again!" With each repetition, Cedric's mom slightly alters the words of the bedtime story out of necessity (she's exhausted) and because she has an agenda (get Cedric to bed). The distinction between reality and fantasy slowly meld into one another until the bedtime story becomes Cedric's story. It's very clever. 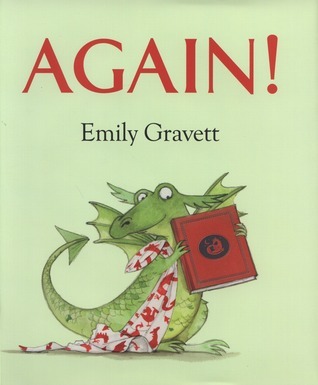 I've loved Emily Gravett's illustrations for a long time (I think Blue Chameleon was the first book I read of hers). Because of the combination of pencil and watercolor, the pictures are detailed, but with soft, dreamy edged lines. I never did the "again" thing. Well, sometimes I'd read a book twice if bribed appropriately (a kiss), but never more than that. I figured that if I wasn't having fun, then why was I reading? So this book would've been fun for us.